Our house is a converted 'resinier's' cottage surrounded by open countryside with three bedrooms and a good sized swimming pool. Our house is situated in a small hamlet called St Helene de L'Etang about 5 kilometers from Carcans. The house is close to the largest freshwater lakes in France and the surfing beaches of the Atlantic. The local area : Carcans has the essential supermarket but also the traditional French shops and local market. The 'cave' is well stocked with Bordeaux wine and there is a very good baker and butcher . Maubuisson is ten minutes' drive away and there you will find sandy beaches, cafes, restaurants, sailing, wind surfing and safe swimming. Ten minutes beyond Maubuisson is the Atlantic Ocean, with miles of unspoilt beaches and breakers for surfing and invigorating swimming. There is golf, cycling and horse riding within easy driving distance including wonderful cycle tracks from Maubuisson through pine forests to the Atlantic beaches. The immediate area : The tiny hamlet of St Helene de L'Etang consists of ten houses including ours which is at the end of the road opposite a small farm which has camping facilities in the summer. Beyond our house, the road becomes a sandy track leading to the largest freshwater lake in France which is accessible on foot (20 minutes) or by bike (10 minutes) but this area of the lake is a nature reserve and the main lake beaches for swimming etc are 10 minutes' drive away at Maubuisson . Very little traffic passes our house making it ideal for children. Wildlife abounds including frogs, toads, rabbits, deer, lizards and a wide range of birds. We have no fences round our property. Lovely welcome from Aude, local manager who took us through essential info key to which are fresh pastries and breads that can be ordered each morning. House spacious, airy, clean and with all amenities needed for the stay. Pool a huge hit with all of us; 3 adults, 3 children, big enough for numerous inflatables, again clean. House situated in large grounds, peaceful and quiet but within a few minutes drive of Carcans where the supermarket and local shops have everything we needed. Hired bikes, again organised by Aude, and cycled to Maubisson, slice of paradise with white sands and warm lake; cycle paths excellent and flat! Carcans Plage amazing for the surf and spectacle of protected dunes, variety of restaurants and shops but not touristy. Would definitely recommend to those who like to do something and nothing and we will probably return. Would say car is needed. Delighted you had a lovely stay and thank you for taking the trouble to write a review. We are 2 families with grown up children. We had a wonderful stay in Chez resinier. We spent most of the time lounging round the pool and eating alfresco. The house was very comfortable and well equipped for all our needs. The owner Vivien was a pleasure to deal with and sent us very comprehensive guides to the house and all the facilities in the surrounding area. When we arrived we were met by Aude who was very friendly and was only too happy to help us with all our various questions about the house and surrounding area. Would we recommend this house to our friends? Would we come again? Absolutely on both counts. Thank you very much for submitting this review. We hope to welcome you and friends and family back in the future. We were a family of four adults and had a fantastic week in this villa. We cook a lot rather than eat out so were pleased to find a kitchen with everything we needed. The main bedroom with en suite was beautiful and the swimming pool was essential as we had a heat wave when we visited. The villa has a quaint rustic charm which made you feel immediately at home and relaxed. There was no noise or disturbance. Aude across the road was excellent. One of the party hired a bike for the week - it looked brand new and the service was excellent. Good wifi and TV. We visited Chateau Spleen in nearby Moulis for a vineyard tour and tasting which was excellent. Hourtin Plage was the best beach for us, much quieter than the others. If you want a relaxing week with no fuss then this is recommended. Thank you for writing this guest review and we are delighted you enjoyed your stay at Chez Resinier. The beaches to the north of us are generally quieter than Lacanau Ocean and Carcans Plage and often it is much easier to park. We spent a delightful week in this quiet country house near Carcans. The house is on a large lawned property within a cluster of homes surrounded by pine forest.. It is very quiet, yet just minutes away from town and stores. The house itself is spacious,comfortable, clean, and well-furnished. We appreciated the large, well-equipped kitchen and that large dining table that allowed us to spread out our computers at one end and still have room for meals. All the appliances and bathroom fixtures worked great. Full dishwasher and clothes washer. Great internet access. The property is large enough to allow one to spend the day at the house or by the pool. And, it is very close to cute villages like Carcans, Hourtin, and Lacanau Plage. Pauillac, at the heart of the Medoc wine country is only 20 minutes away. Lots of wine chateaux and estates to visit, another great experience. There are plenty of large stores close enough to provision with whatever is desired. The nearby manager is very helpful and speaks good English. She helped us rent bikes to explore the wonderful new asphalted bike paths leading to Carcans, Maubuisson, and Hourtin. We certainly recommend this house to anyone who likes to enjoy the countryside but also wants sites to see and outdoor activities to enjoy. Delighted you enjoyed your stay and thank you for writing this review and allowing us to share your appreciation with others. Lovely homely feel but with all mod cons and plenty of space. Quiet enough to feel you're in the middle of nowhere but close enough to cycle into Carcans. Perfect sized pool but if you don't fancy lounging around a trip to nearby Maubuisson lake beach or be spoilt for choice of surfing beaches. We had a really good time. Maison très sympa et spacieuse. La piscine est très bien, le tout dans un environnement calme et assez sauvage derrière le lac. Les enfants ont adoré, beaucoup d'activités à Bombannes et l'océan n'est pas loin. Really nice property in quiet environment. Kids love the swimming pool, all the activities in Bombanne and the ocean. 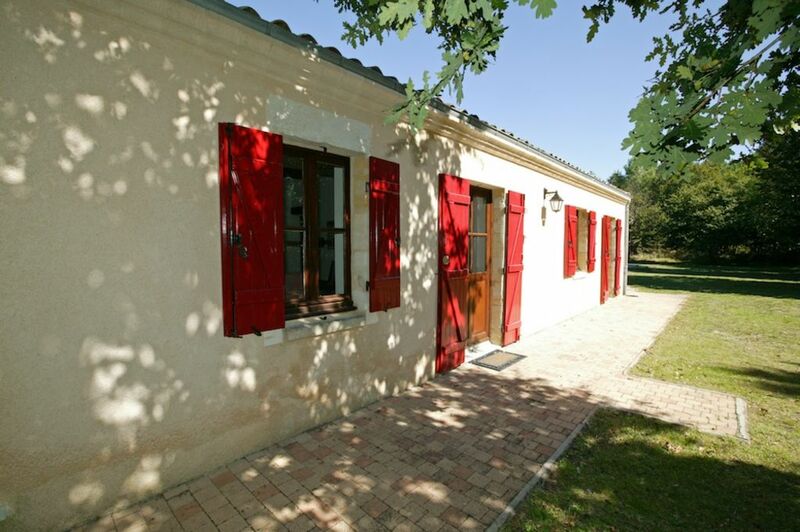 Aude looking after the property is great, very helpful and you have fresh bread and croissants every morning. Merci beaucoup . Delighted you and your family enjoyed your stay and I hope we can welcome you back in the future. Our house is located between Carcans and Hourtin in the coastal Gironde. It is situated in a small hamlet called St Helene de L'Etang about 5 kilometers from Carcans and close to Maubuisson and the Lac du Carcans and Hourtin and the famous surfing beaches of the Atlantic such as Carcans Plage and Lacanau. Also close by are the wine regions of the Medoc; further afield but still within easy driving distance are Bordeaux; St Emilion and Arcachon and the Pyla Dune. Our payment terms are a 25% non refundable deposit plus the balance two months before arrival. We are happy to accept sterling; euros or dollars. We will accept credit card payments through pay pal but that incurs a 4% extra charge. Rental prices include bed linen and towels and free wifi. We would consider stays of less than 7 nights in the low season periods. In the event of cancellation, we will only refund any monies paid if we are able to re-let the house for that period.